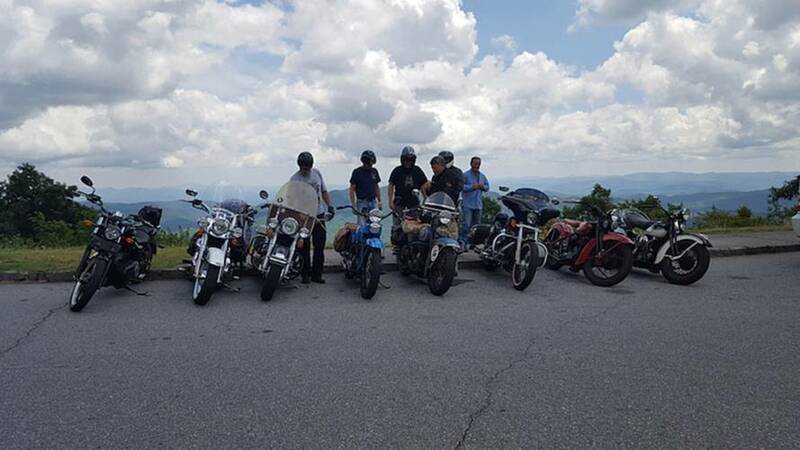 Panhead Jim and some friends take their vintage motorcycles to the Blue Ridge Mountains. 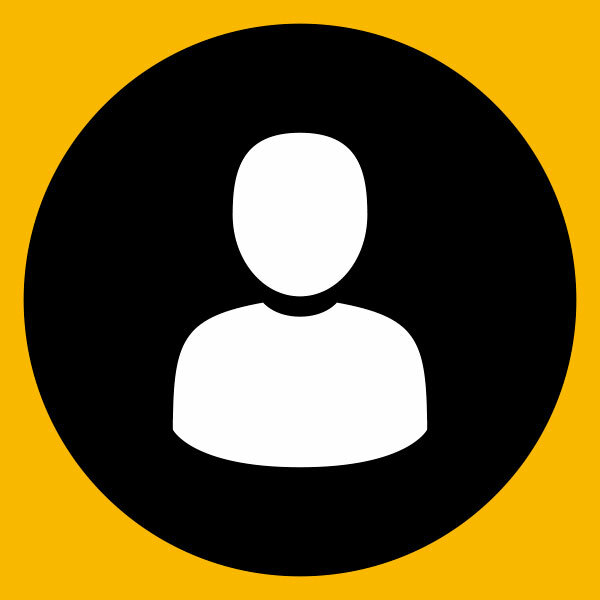 It has been one of those summers here in the southeastern United States. Temperatures have been in the upper 90s for weeks at a time with the heat index climbing past 100F more often than not. 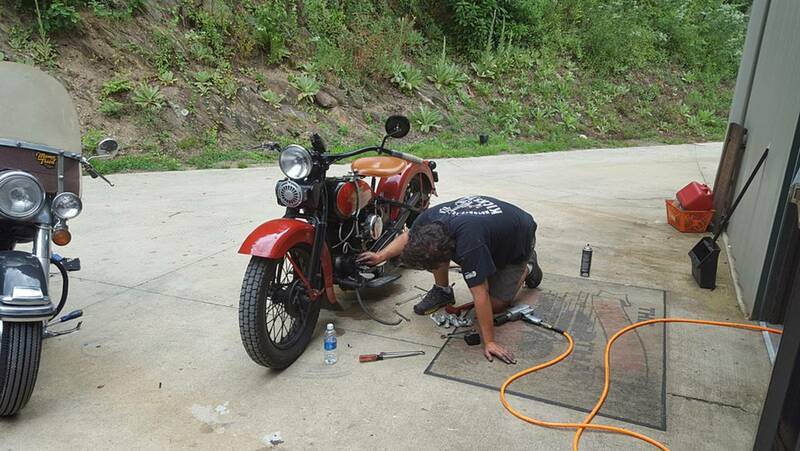 It’s been challenging to spend much time in the saddle, so I was really looking forward to participating in this year’s Kickstart Classic and spending a few days riding in the mountains of North Carolina. 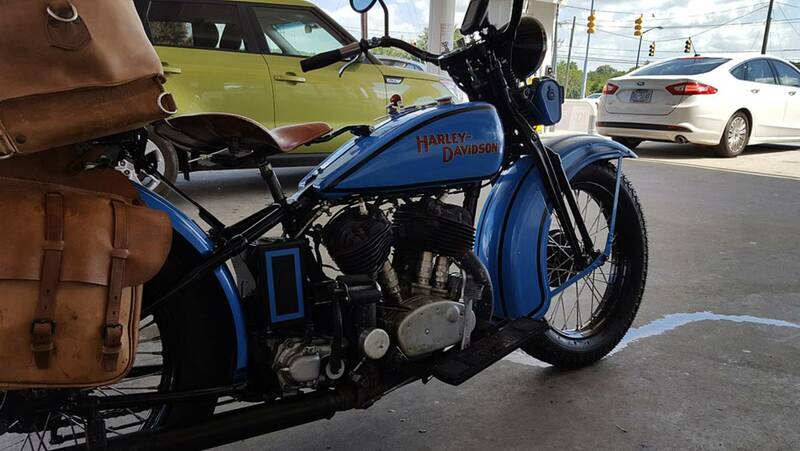 The Kickstart Classic is an annual event that brings together vintage motorcycle enthusiasts (hence the name) for a multi-day ride on some great antique iron and some of the best roads on the East Coast. In years past we have ridden as far north as New Hampshire and as far south as Florida. This year we were right in the middle, based out of Maggie Valley, North Carolina, and hosted by the Wheels Through Time museum. For me, the trip to Maggie Valley is about 250 miles. 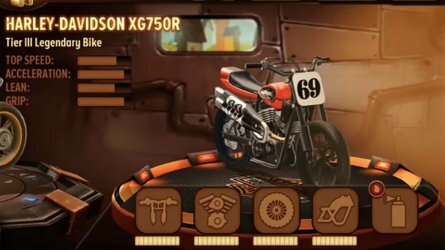 Just a short ride on a modern bike, but on a 1933 Harley-Davidson VL, a ride of that distance takes a little preplanning. 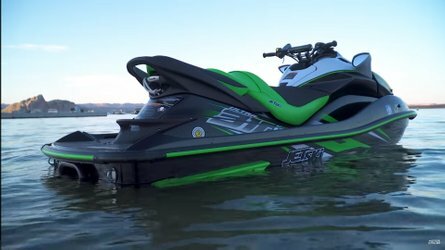 I went through the standard checklist of fluid changes, adjustments, etc., and figured that while I was at it, I would repack the grease in my kicker assembly. Because it is always good to take something apart unnecessarily before a big trip. As usual I was in the garage until well past midnight on the night before the ride, trying to get everything finished. My VL has a total loss oil system, so every trip begins with topping off the oil tank. The next morning I was packed and ready to roll out by 08:00, hoping to beat the heat and miss the morning commuter traffic. 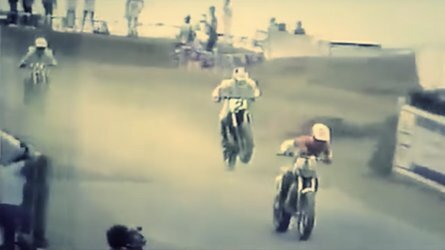 I cranked up the bike and right away I could tell something was not right with my transmission. The kicker gears were making a lot of noise and after a lap around the block, there was no improvement. 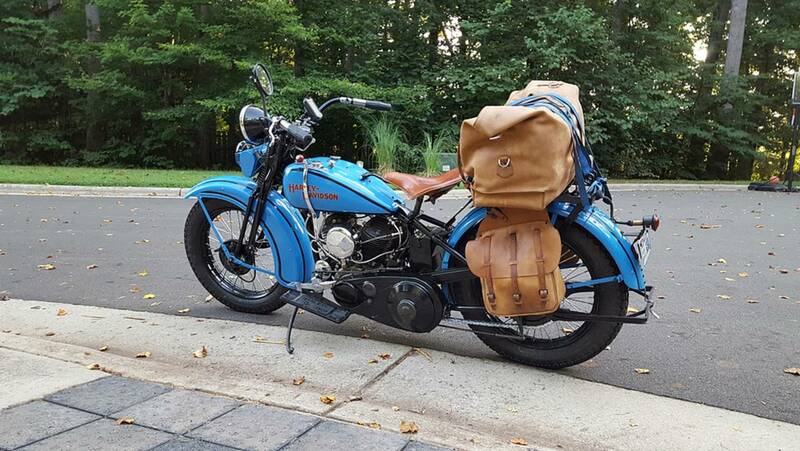 My '33 VL, loaded down with tools, extra oil and a few pairs of clothes. The ride to Maggie Valley can best be described as oppressive. Between the heat coming off the road and the 500F motor between my legs (yes I checked the motor temp), it was a long 250 miles across North Carolina. 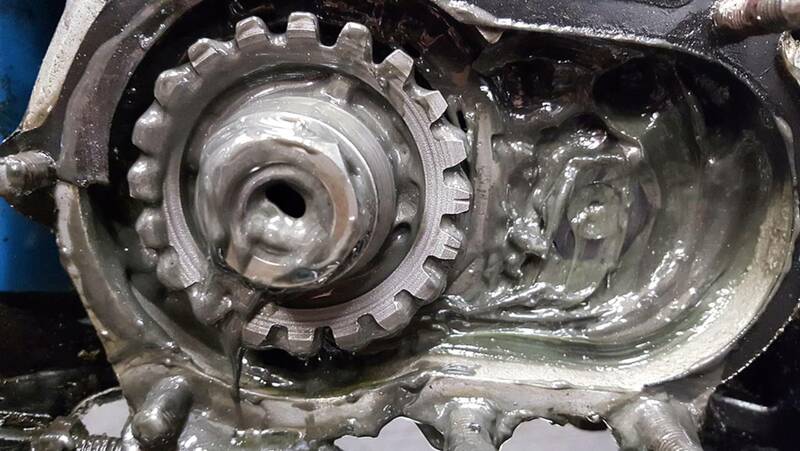 As expected, the extra grease did not solve the kicker gear issue, but I figured there would be plenty of time to tear into the transmission once I arrive at Wheels Through Time. Waiting in the shade for my engine to shed a couple hundred degrees of heat. Five hours after getting on the road, I pulled into the gravel lot at WTT and, after a quick look around, I was ready to tear into my transmission. Coincidentally, two of my buddies arrived within the hour, both with their own transmission issues. Soon there were three bikes surrounded by nuts, bolts and various transmission parts as we set to making repairs in the parking lot. 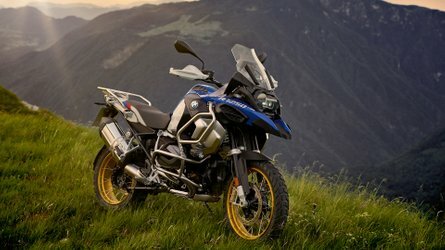 Who wants to work on their bike at home, when they can crawl around in a hot parking lot? My issue turned out to be a misalignment of the kicker gear, which was an easy 15-minute fix once I was reminded that there are timing marks for correctly aligning the gears. My friends didn’t have the same luck as one had a stripped thread in his clutch pack and the other had a mysterious noise coming from his transmission. Still, by dinner time, all three bikes were reassembled and ready to hit the mountains the next day. Those two marks make all the difference when setting up the kicker gears. 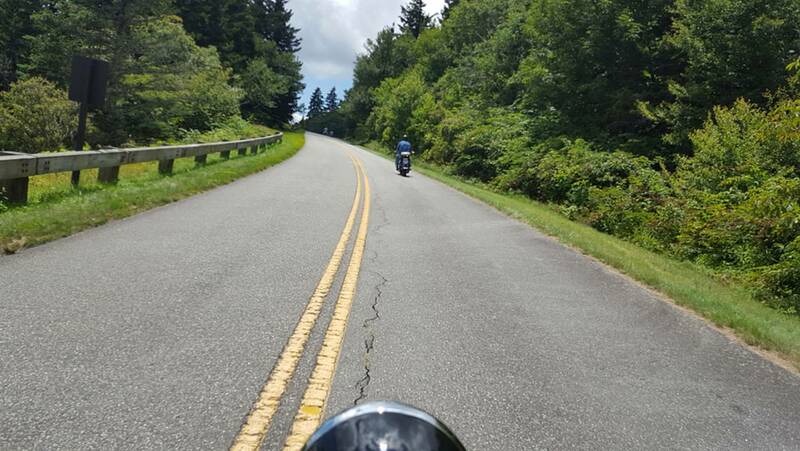 If you’ve ever ridden in western North Carolina, you probably know that there are no “bad roads” when it comes to riding through the Blue Ridge Mountains. We chose a route that took us up to the Blue Ridge Parkway and over to Mount Pisgah for lunch. From there we continued to the highest point on the Parkway and eventually worked our way back to Maggie Valley. After a long, sweaty ride up to the mountains the day before, this was just what I needed. The Parkway is a great stretch of road for riding a vintage motorcycle, with just enough curves to keep things interesting but not so many that it feels like a day at the track. 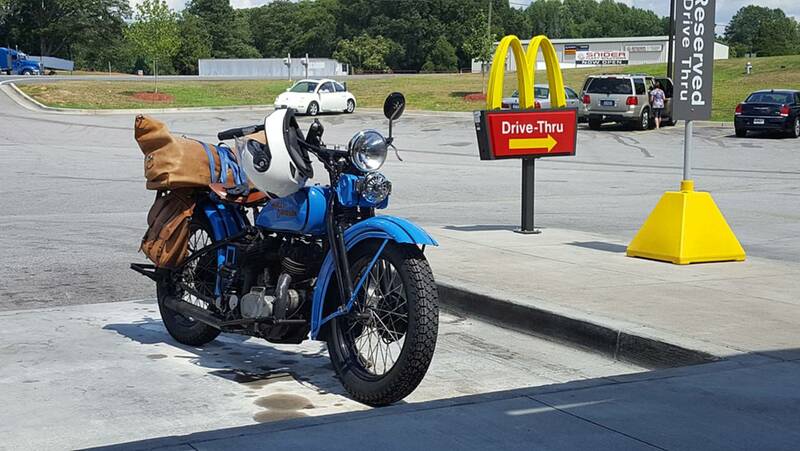 The second day of riding found us heading south through the mountains with the goal of reaching Chesney, South Carolina, for the Antique Bikes on Main event. As our pack of 50+ antique motorcycles smoked through the mountains, I wondered if the local inhabitants would thank us for helping to eradicate the local mosquito population. After the first gas stop, I pulled out and began to work my way through the gears on my VL. First, no problem, second, no problem, third... problem! 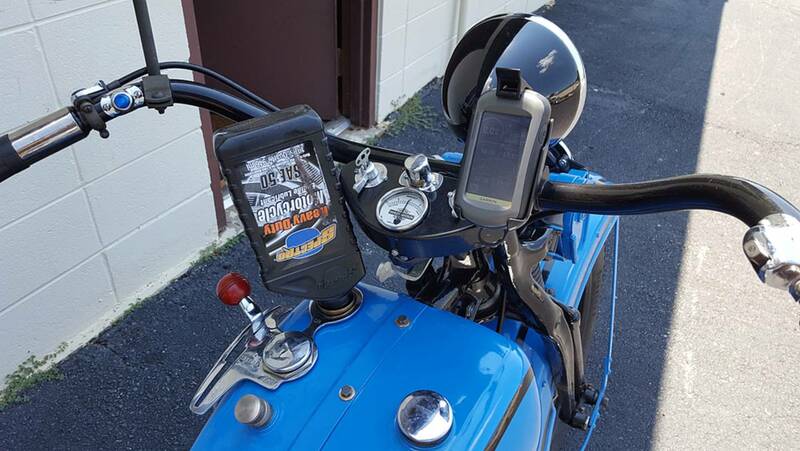 As I pushed down the clutch pedal and tried pulling the shifter back into third, I soon realized that the bike was stuck in second gear (que theme song to "Friends"). After a few unsuccessful attempts at going back into third, I tried going forward into neutral, but the transmission was stuck fast. Now I was faced with having to stall the bike in order to come to a stop, which was not the greatest option. While all the possible bad outcomes of a quick stop were going through my mind, I took a moment to look down at the clutch pedal. To my surprise I saw that the rod that attaches the pedal to the transmission had become detached. 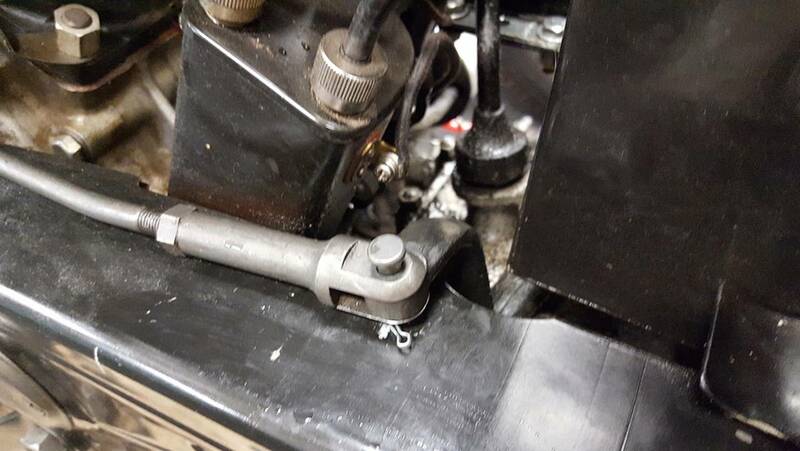 Normally, the clevis on my clutch rod would be pinned to the clutch arm on my transmission to operate the clutch. The clutch rod uses a clevis pin with a cotter pin to attach to the transmission and clearly the cotter pin had broken. By some stroke of luck, the clevis pin had not completely fallen out and I was able to reach down, grab it and stuff it into my pocket. Then I held the clutch rod in place while I pushed down the clutch pedal and quickly bumped the transmission into neutral before the clutch rod popped back off. Coasting to a gas station, I hopped off the bike and got a paperclip from the attendant. Five minutes later the bike was re-assembled with the paperclip acting as in impromptu cotter pin. 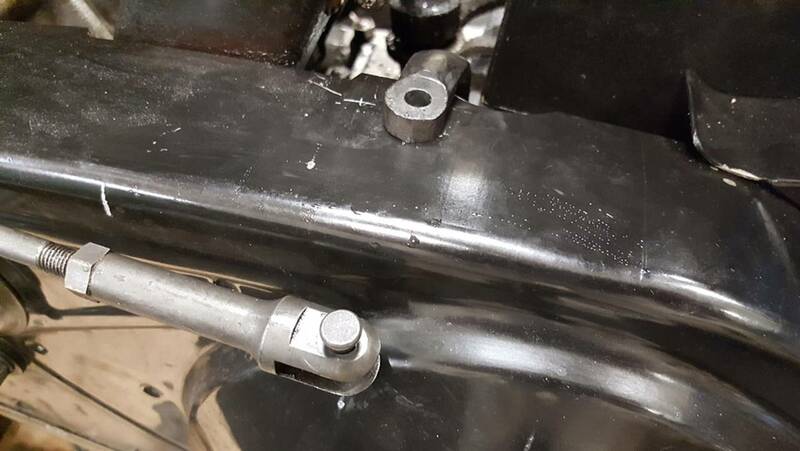 Here's how the clutch rod and clutch arm are supposed to be connected. Makes a big difference in operation! Of course, by this time I had lost the group, but one other rider had stayed back to make sure I was OK. With a vague idea of where we needed to go, we set out hoping to catch the group by lunch time. Within 10 minutes, the other bike was pulled over with a broken clutch cable (I kid you not) and he was forced to call a truck to come get the bike. I continued on and after asking for directions at every stoplight, and flagging down a FedEx driver, I finally found the group just as everyone was finishing up lunch. 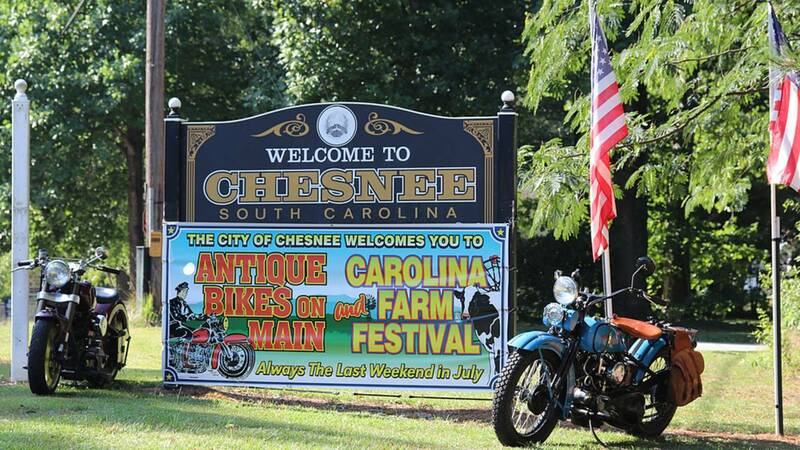 By the time I rolled into Chesnee, the bike was running great. From there I rode the rest of the way into South Carolina without any issues. Now that we were out of the mountains, we were right back into the sweltering heat, but the festivities at Antiques Bikes On Main helped to distract us for the rest of the weekend. Around noon on Sunday, I rolled out from Chesney and made another long, hot ride back home. As always, riding an 83-year-old bike was a challenge, but with a little know-how and a few hand tools I successfully made the 700+ mile trip and am already looking forward to my next adventure. Gas stop on the way home. Both me and my bike need a lot of grease to run smoothly.